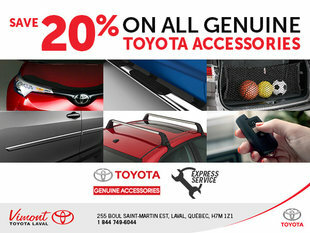 When it comes to servicing your Toyota vehicle in Laval, Vimont Toyota wants to be your trusted dealership. That’s why we do everything in our power to ensure your complete satisfaction, and treat you with respect and courtesy as soon as you enter our dealership. We know that it can be difficult to find a trustworthy dealership for the service and maintenance of your Toyota vehicle, and that’s why we make sure that we take the time to answer all of your questions and explain each service or maintenance procedure ahead of time to avoid any unpleasant surprises. At Vimont Toyota, we offer modern facilities and a team of trained technicians that know Toyota vehicles inside and out. We also use the latest equipment and diagnostic tools in order to ensure that our work is of the highest quality. And while you wait for your vehicle, you can relax in our modern lounge, complete with Wi-Fi and a host of other amenities. We also offer you a complete selection of genuine Toyota parts and accessories which have been specifically designed for your Toyota vehicle, along with a range of winter and summer tires that can get you through any kind of weather. Finally, our detailing packages will ensure that your Toyota looks as good today as it did on the first day you bought it. At Vimont Toyota, we're all about helping you save money, which is why we offer our customers a variety of rebates and special offers that make it more affordable than ever to trust Vimont Toyota on the North Shore of Montreal with all of your after-sales needs. To learn more about our various after-sales services and packages, or to book an appointment, contact us today at Vimont Toyota at (450) 668-2710, or online using our contact form.